Burns Park Elementary students this week put into practice a simple new way to make crossing an intersection a bit safer. And it’s as simple as carrying a bright orange flag while crossing the street. 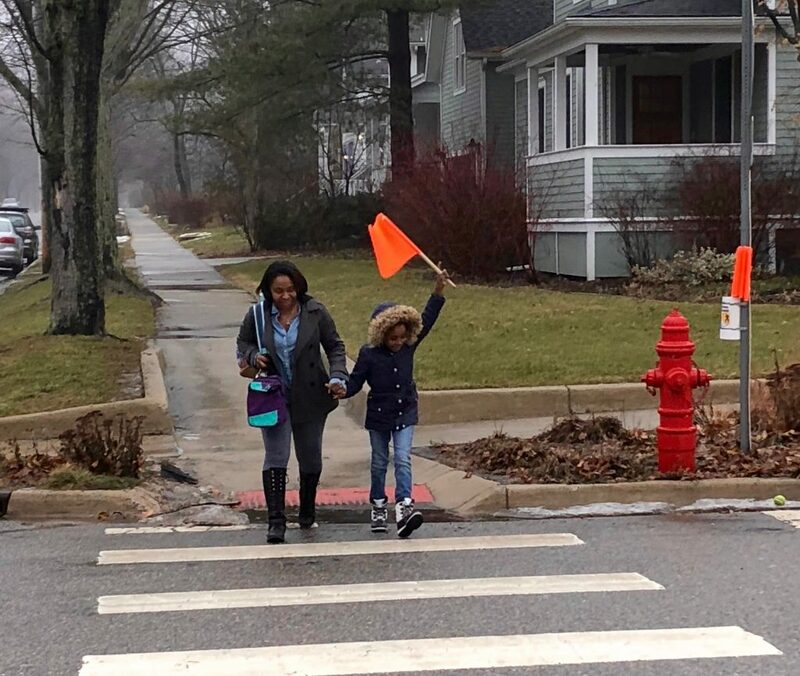 Burns Park parent Gabrielle Gillard was visiting her sister in California last year when she noticed students carrying bight orange flags in cross walks to alert drivers to their presence in the street. She later learned such programs are in place around the world. “So we didn’t have to reinvent the wheel,” she says. Gillard mentioned the idea to Burns Park Elementary Principal Chuck Hatt, who had expressed concern about the intersection of Wells and Lincoln near the school. He immediately liked the idea. One thing led to another, the PTO provided the $67 to purchase 10 flags and receptacles, and this week, the new street crossing plan took off. Containers are attached at both sides of the intersection to hold the flags. One is attached to a fence, the other to a stop sign. Flags are left in the containers for pedestrians to take and wave as they cross the street. Once across the street, they leave the flag in the container for the next pedestrian. Assistant Principal Laura Wolf says the intersection of Wells and Lincoln is a busy one, with many pedestrians crossing here before and after school. “It is also near where our buses drop off and many cars are in this area as well so it can be quite congested at critical times of the day,” she says. In some cities, the program has been discontinued due to the flags being misused and stolen. The hope is that won’t be a big problem here. Liz Margolis, the district’s executive director of student and school safety, says the district hopes to replicate this crossing protocol at other schools. 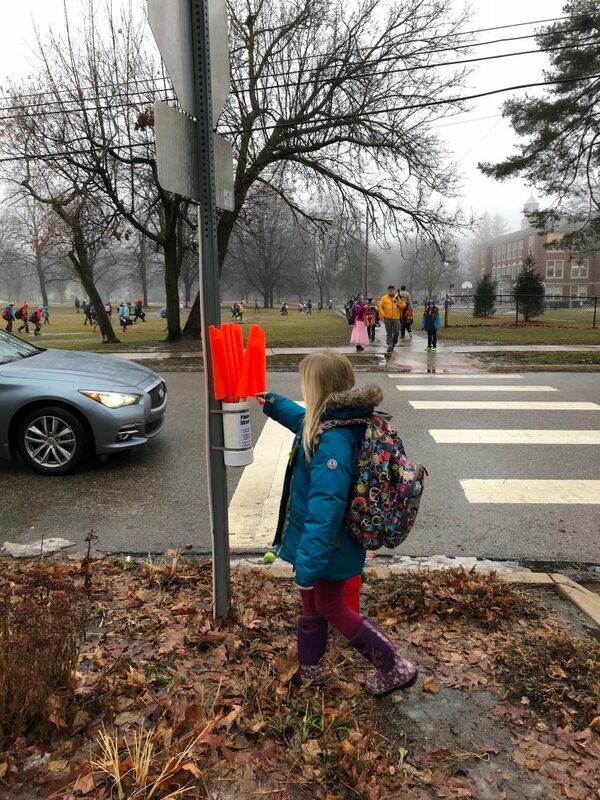 She noted that some schools have identified areas for adult crossing guards hired by the city of Ann Arbor, with shared funding. Those areas have been identified as major crossing with a high safety risk. But not all crossings fit in this category. All the Burns Park students were trained in their classrooms as to how to use the flags. If the intersection is so dangerous that flags are needed, the intersection should be redesigned. Children should not be put in the position of defending themselves against motor vehicles. Rather, the roads must be designed to accommodate all users safely.